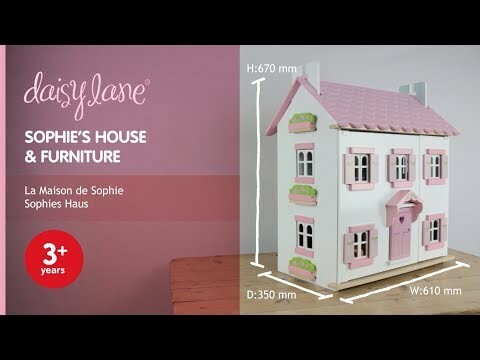 The Le Toy Van Sophie's Dolls House Bargain Bundle is a fantastic special offer including all six sets of the Daisylane dolls house furniture. This grand two storey dolls house comes with a hearts motif. A staircase links two floors and an attic room for more fun and games. It features numerous window styles. The rooms are individually painted in colour. It comes flat packed but is very easy to put together. Figures sold seperately. Lovely dolls house and furniture, good quality and the cheapest I could find anywhere for the same thing. Be warned that the furniture is quite big and not all of it will fit in the house at once, really it only takes one room per floor. But you can then mix and match the furniture to keep it interesting. Overall, lovely dolls house.